There once lived in Babylon two lovers named Pyramus and Thisbe, who were parted by a strange mischance. For they lived in adjoining houses; and although their parents had forbidden them to marry, these two had found a means of talking together through a crevice in the wall. Here, again and again, Pyramus on his side of the wall and Thisbe on hers, they would meet to tell each other all that had happened during the day, and to complain of their cruel parents. At length they decided that they would endure it no longer, but that they would leave their homes and be married, come what might. They planned to meet, on a certain evening, by a mulberry-tree near the tomb of King Ninus, outside the city gates. Once safely met, they were resolved to brave fortune together. So far all went well. 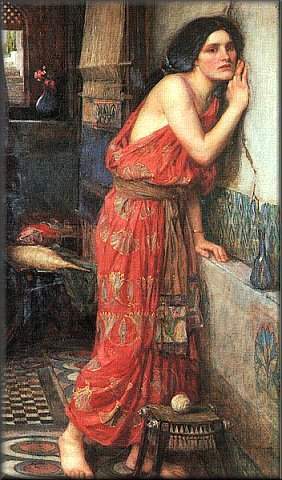 At the appointed time, Thisbe, heavily veiled, managed to escape from home unnoticed, and after a stealthy journey through the streets of Babylon, she came to the grove of mulberries near the tomb of Ninus. The place was deserted, and once there she put off the veil from her face to see if Pyramus waited anywhere among the shadows. She heard the sound of a footfall and turned to behold not Pyramus, but a creature unwelcome to any lovers tryst: none other than a fierce lioness crouching to drink from the pool nearby. Without a cry, Thisbe fled in fear of the lioness, dropping her veil as she ran. She found a hiding-place among the rocks at some distance, and there she waited, not knowing what else to do. The lioness, having quenched her thirst after some a ferocious meal, turned from the spring and, coming upon the veil, sniffed at it curiously, tore and tossed it with her blood-reddened jaws, as she would have done with Thisbe herself, then dropped the plaything and crept away to the forest once more. It was but a little after this that Pyramus came hurrying to the meeting-place, breathless with eagerness to find Thisbe and tell her what had delayed him. He found no Thisbe there. For a moment he was confounded. Then he looked about for some sign of her, some footprint by the pool. There was the trail of a wild beast in the grass, and near by a woman's veil, torn and stained with blood; he caught it up and knew it for Thisbe's. So she had come at the appointed hour, true to her word; she had waited there for him, alone and defenseless, and she had fallen a prey to some beast from the jungle! As these thoughts rushed upon the young man's mind, he could endure no more. "Was it to meet me, Thisbe, that you came to such a death!" cried he. "And I followed all too late. But I will atone. Even now I come lagging, but by no will of mine!" So saying, the poor youth drew his sword and fell upon it, there at the foot of that mulberry-tree which he had named as the trysting-place, and his life-blood ran about the roots. During these very moments, Thisbe, hearing no sound and a little reassured, had stolen from her hiding-place and was come to the edge of the grove. She saw that the lioness had left the spring, and, eager to show her lover that she had dared all things to keep faith, she came slowly, little by little, back to the mulberry-tree. She found Pyramus there, according to his promise. His own sword was in his heart, the empty scabbard by his side, and in his hand he held her veil still clasped. Thisbe saw these things as in a dream, and suddenly the truth awoke her. She saw the piteous mischance of all; and when the dying Pyramus opened his eyes and fixed them upon her, her heart broke. With the same sword she stabbed herself, and the lovers died together. There the parents found them, after a weary search, and they were buried together in the same tomb. But the berries of the mulberry-tree turned red that day, and red they have remained ever since.